Employment may lag in a recession, but yours doesn’t have to. Excellent opportunities for growth and development exist at small or local businesses and nonprofits that don’t routinely recruit at colleges. They can be sought out by taking advantage of Library and Career Services resources. The library has a guide to Finding Potential Employers and Career Services offers instruction on using ReferenceUSA, an excellent business directory for employers both large and small. A thoughtful search of our catalog will turn up both humorous and serious books that will enrich your job search and career exploration. 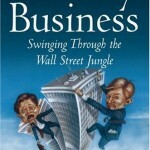 For instance, if you’re interested in finance as a career Monkey Business is an hilarious must read. Practioner guides especially those that are conveniently online, such as The Complete CFO Handbook, offer more serious fare for pre-interview preparation. Make an appointment with a research librarian to learn more about how to use these and other resources for gathering background on potential employers.